Christopher McDougall's Born to Run: A Hidden Tribe, Superathletes, and the Greatest Race the World Has Never Seen is an investigation into ultrarunning, the Trahumara Indians, the running shoe industry, and more. Born to Run is currently in The New York Times Top 5 best sellers list for Hardcover Nonfiction. Your background is as a journalist—you were a war correspondent. How did you end up writing a book on ultrarunning? By sheer coincidence and indignation. I was in Chihuahua on assignment from The New York Times Magazine to locate a fugitive Mexican pop star who was secretly running a brainwashing cult (true story). I happened to be flipping through a Mexican science magazine, and spotted a photo of an old man in what looked like a robe and sandals. He was tearing down some gnarly trail, and the caption said he was a 55-year-old Tarahumara Indian who'd won a 100-mile race through the Rocky Mountains. I'd just been told by a doctor that running even a few miles a day would destroy my knees, so as I stared at that photo, I wondered how that old guy could get away it and I couldn't. A few weeks later, I was trekking into the Copper Canyons in search of the Tarahumara. You argue that humans have evolved to run long distances. How convincing is the evidence for that? Very. Running is the only solution that resolves a handful of mysteries about human existence. Here's one: 2 million years ago, the human brain suddenly exploded in size. It only could have grown so quickly if early humans had a reliable source of condensed caloric energy—meat. The only problem is, the first spear heads only appeared 200,000 years ago. So how did humans get meat for nearly 2 million years without any weapons? Simple—by running animals to death. We're great at venting heat on the run by perspiring. Other mammals can only cool off by panting, giving us an amazing advantage. You're not just an observer in the book, you also trained for and ran an ultramarathon. What was that experience like? A total blast. 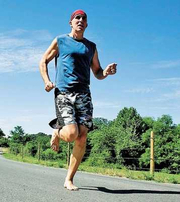 By learning to run like the Tarahumara, I felt like I'd been given back the use of my legs. Running was no longer an aching misery. Instead, I quickly became energized, lightfooted and fast (well, relatively). In nine months, I lost 30 pounds and transformed from a guy who couldn't run 5 miles without getting hurt into a guy who could race 50. How long did you spend—start to finish—researching, (running), and writing this book? It's been a long haul—over 5 years. The surprising thing wasn't how difficult it was to unearth information about the Tarahumara—it was how much startling new research about human running was breaking while I was writing. I found myself on the cutting edge of new breakthroughs that were emerging every few months, so I had to keep current and fold those into the book. What are some of the things you learned from the Tarahumara Indians? The key secret hit me like a thunderbolt. It was so simple, yet such a jolt. It was this: everything I'd been taught about running was wrong. We treat running in the modern world the same way we treat childbirth—it's going to hurt, and requires special exercises and equipment, and the best you can hope for is to get it over with quickly with minimal damage. Then I meet the Tarahumara, and they're having a blast. They remember what it's like to love running, and it lets them blaze through the canyons like dolphins rocketing through waves. For them, running isn't work. It isn't a punishment for eating. It's fine art, like it was for our ancestors. Way before we were scratching pictures on caves or beating rhythms on hollow trees, we were perfecting the art of combining our breath and mind and muscles into fluid self-propulsion over wild terrain. And when our ancestors finally did make their first cave paintings, what were the first designs? A downward slash, lightning bolts through the bottom and middle—behold, the Running Man. The Tarahumara have a saying: "Children run before they can walk." Watch any four-year-old—they do everything at full speed, and it's all about fun. That's the most important thing I picked up from my time in the Copper Canyons, the understanding that running can be fast and fun and spontaneous, and when it is, you feel like you can go forever. But all of that begins with your feet. Strange as it sounds, the Tarahumara taught me to change my relationship with the ground. Instead of hammering down on my heels, the way I'd been taught all my life, I learned to run lightly and gently on the balls of my feet. The day I mastered it was the last day I was ever injured. What do you wear on your feet to run now, if anything? Usually nothing. I run about 5 to 10 miles a day in my bare feet. If necessary for really gnarly trails, I'll slip on a thin, rubber foot glove called the Vibram Fivefingers. How do you think someone who doesn't currently run should get started? Couldn't be simpler: same way humans started 2 million years ago, and the way children start every day. No. 1, go barefoot. No. 2, relax and bounce lightly on the balls of your feet. No. 3, when it feels uncomfortable, stop and take a rest. We have this horrible modern work-ethic myth that running has to be hard and relentless and painful. No, that's only the way an animal runs when it's being chased to death. Why should we run the same way as the animal we're trying to kill? Instead, we should follow the excellent advice of Caballo Blanco, the mysterious "White Horse" I met down in the Canyons: "Easy, Light, Smooth and Fast," was his motto. "Focus first on easy, because if that's all you get, that ain't so bad." I know you're busy running, but what are you reading these days, if you have the time? I just got my hands on The Believers, by Zoe Heller. I'm sure it will be great because she never writes anything that isn't. Plus, my nine-year-old daughter and I are devouring the five-part Percy Jackson and the Olympians series together. That Rick Riordan is a genius.